This is one of those dishes that I first heard about when I started Weight Watchers. But with a name like ‘Yum Yum’ I didn’t really jump to try it. Now that I have given it a shot, it’s one that I love to eat. It’s got an Asian taste to it but can really go with anything. I’m going to try this on fish next to see how it works with something delicate. I’ve shared this dish on the site before but here I’ve increased the sauce and paired it with potatoes to make it a one pot casserole. Next time I may even double the sauce again to make sure there is enough to cover every plate. Season pork chops with salt and pepper. Add about a teaspoon of vegetable oil to a frying pan and heat over medium heat. Brown pork chops on both sides then set aside. Add chopped potatoes to a casserole dish sprayed with non-stick spray. Season with salt and pepper. Mix all remaining ingredients and whisk to combine. 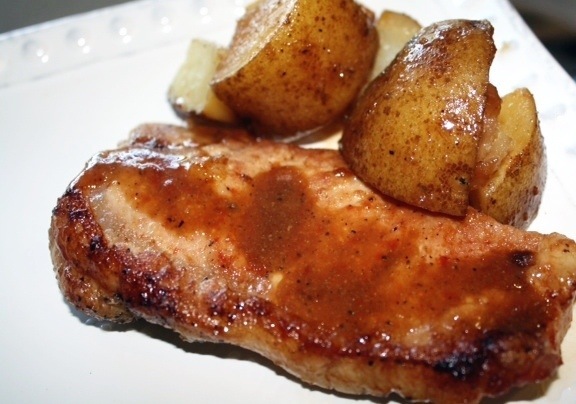 Pour the sauce over pork chops and potatoes. Bake, uncovered, at 350 degrees for 45 minutes, stirring once to ensure juice gets into pork chops.